IBC SHOW, AMSTERDAM, Netherlands, 9 September 2016. 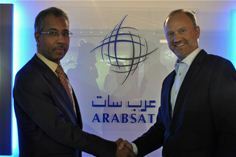 Arab Satellite Communications Organization (Arabsat) and Newtec – a specialist in designing, developing and manufacturing equipment and technologies for satellite communications – have announced an expansion of their partnership, enabling optimized solutions for broadcast and telecom customers. Signed today during IBC 2016, the new contract will see Newtec provide Arabsat with its Newtec Dialog® multiservice platform to enhance the operator’s Direct-to-Home (DTH) services, as well as its offerings in government and telecom markets. Newtec Dialog is a multiservice platform which enables tailored services and guarantees optimal modulation and bandwidth allocation, whether it is being used to provide enterprise, consumer broadband, cellular backhaul or mobility services. It features three return technologies – MF-TDMA, SCPC and Newtec’s unique Mx-DMA® – ensuring maximum bandwidth efficiency and return on investment. Newtec’s solution for Arabsat also incorporates its pre-distortion technology Equalink®, which can provide an additional 15% of data traffic in the same satellite capacity. The training and certification delivered by Newtec is professionally run by experienced engineers, familiar with the challenges Arabsat and its customers face and includes a comprehensive online examination program and online renewals. The certification is recognized globally and will ensure Arabsat gets the most out of the Newtec equipment installed. Delegates attending IBC 2016 can find Arabsat in hall 1, stand B38, and can view a demo of Newtec’s Mx-DMA technology at the Newtec booth in hall 1, stand A49. Two technology demonstrations of the solution provided by Newtec to Arabsat are also already planned for early next year, including at CABSAT show 2017.